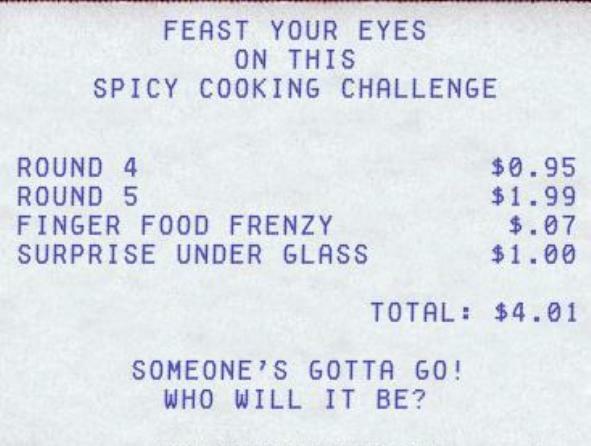 Feast Your Eyes on This Spicy Cooking Challenge- April Fools Round – I Love It Spicy! This video is all screwed up. Yup. Goes all wonky @ 3:31 in. Kinda reminds me of the moving “The Ring”. Video goes wonky @ 3:31, sound cuts out @ 4:08, then everything comes back @ 4:30 (for the P&M promo), then no sound and bad vid @ 5:16, most of the sponsor clips are ok, and @ 8:00 where the next round description starts, everything’s fine, until you announce the winner when the sound cuts out. Could this be a side effect of the compression software? Is that what they call it these days? Well its been fun, guess who lost? No 6 1/2 inch Trinidad Scorpion Videos now! Best of luck to all the competitors! Too bad you didn’t throw a temper tantrum or something…that would have been hilarious! I just got home from a long day. I met a buddy @ 5:30 that was delivering 4 cases of sauce to the Portland WholeFoods and doing a demo for us today, then went to work. I called my wife from the office phone, because in my early morning grogginess, I left my phone on the counter. I needed to check in and see if I was going to have to come home since Maxx has had a fever for 2 days. He was feeling better and was able to go to daycare. This meant I could stay @ work (WOO HOO), I hate my Pho king job! On the bright side, it meant it would not cost me another $20 to drive back to Seattle to deliver 3 cases of sauce to The Seattle Art Museum’s restaurant. So after an extra long day I come home and check out ILIS. I think HMMM, I just double checked this morning and the schedule was different, winner and round 5 announced APRIL 3. If I’m out, it was fun.